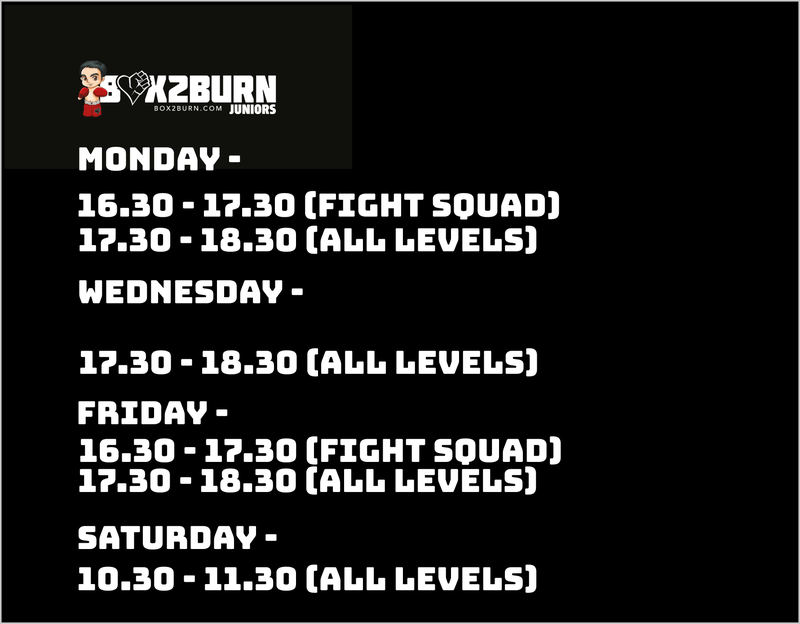 Box2Burn Juniors is a class for older children over the ages of 8 years old. It’s one step up from our Bambino training class. Our Juniors class is for children from ages 8 to 16 and it requires no prior experience. Children can join as beginners or as advanced boxers, as there is plenty to keep children of all activity levels fully attentive during class. Kids will love our fun and friendly class environment. Parents will be pleased to learn that Junior Boxers are trained in a variety of practices to provide for fitness and exercise, as well as how to improve their bodies both mentally and physically. The following are the highest standards of boxing that our instructors aim to teach at Box2Burn. Discipline—Learning discipline in boxing can also help children in all aspects of their daily lives. This better enables children to focus on the tasks at hand. Confidence—Building up self-confidence is one of the most important parts of life. The teen years are also the most sensitive, and confidence is something that can give a child the confidence to learn how to cope and adapt to changes into adulthood. Self-Defence—Self-defence should be taught to children in order to survive in our sometimes unfair world. Learning to defend yourself also ties in with confidence. Together, your children can achieve anything they set their minds to. If you’re seeking the best type of fitness and training program for your children, they’ll be excited to try Box2Burn. It’s a bit different and more challenging for kids who need more focus and attention in achieving a high level of fitness and mental achievement.